Overpaying underperforming talent is a one-way ticket to a top-10 draft pick in the NFL. Refusing to cut bait on those players in the hopes that they turn it around is a good way to stay there. The players below are the most obvious candidates with how their PFF grades and snap counts compare to their upcoming cap hits. While the extension they gave him last offseason makes it difficult to cut him, they’d still save over $4 million against their cap if they did. For a quarterback who was benched last season, it’s difficult to think that he’s part of any future plans. I know no one wants to be the guy that cuts a franchise legend, but the rebuild in New York has to start now. Cutting Manning would create $17 million in cap space to start planning for the future. Flacco hasn’t earned a grade above 75.0 since 2014. He got replaced by Lamar Jackson during the playoff run. Cutting him would save over $10 million in cap space. It’s a no-brainer, really. The Dolphins have bloated contracts all over their roster as we’ll see in a bit. This is a team in need of a complete teardown. 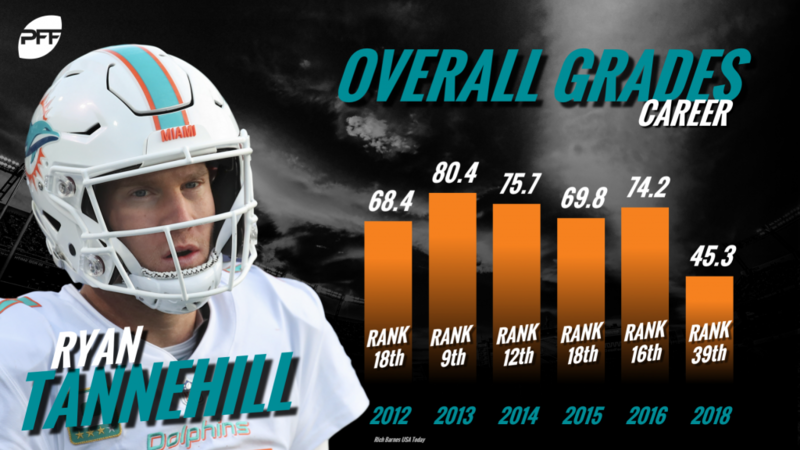 After seven seasons, it’s abundantly clear that Tannehill is not it. They get $13 million in cap space by cutting ties. McCoy turns 31 this year and is coming off his least effective season as a pro. He carries the third-highest cap hit among all running backs in the NFL in 2019. I get that the Bills are hurting for playmakers offensively, but that money could be used to give Josh Allen some protection up front. This one is inevitable. Thomas carries a $14 million cap hit in 2019 and cutting him would wipe all that off the books with no dead money. He’ll be 33 with a cap hit of $10 million in 2019 that has no dead money. Jackson can still get open deep with 374 such yards last year (10th-most), but he was publicly disgruntled with his role in Tampa. Cutting his $8.25 million cap hit would only save them $2.5 million this year, but a 30-year old tight end who had fewer than 100 yards in 13 games last year ain’t moving the needle. Allen has been a complete non-factor in the Pats’ passing game, registering 113 yards in two years there including the playoffs. He carries the 10th-highest cap hit among tight ends in 2019. Peters is 37 carrying a $10 million cap hit in 2019 that, if cut, would save $8 million in cap space. 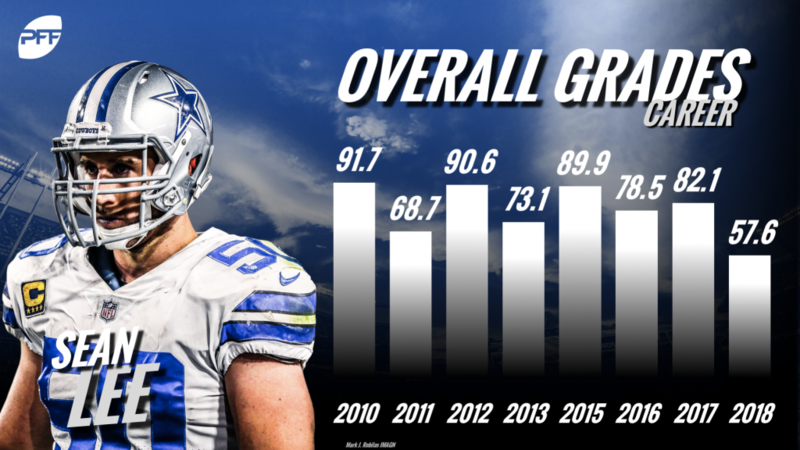 His 69.6 overall grade this season was his lowest since we started grading in 2006. The Eagles are about as cap-strapped as any team in the league and have to clear contracts. The Jaguars have to shed cap somewhere, as they are currently over the cap in 2019. That means one if not both of the above are likely out. Cutting Jackson would save $11 million while cutting Dareus would save $10.5 million. I’d guess Dareus is the odd man out with Abry Jones already on the books for much cheaper at the same position and the fact that Dareus produced all of 14 pressures in 2018. 30 years old, coming off his lowest-graded season as a pass-rusher of his career, with a $13 million cap hit is a bad combination. The rumors are already out there that McCoy is on his way out of Tampa as well. Outside of a PED-aided 2015 seasons, Wolfe has never had a pass-rushing grade above 60.0 in his career. Cutting him would save the Broncos $8.5 million in cap space. He’s still only 29, but Liuget has managed only 611 snaps over the past two seasons. In six games this season, he notched all of 10 pressures. Cutting him would save the Chargers $8 million in space. While the other duo on this list was likely an either/or proposition, this one is both. 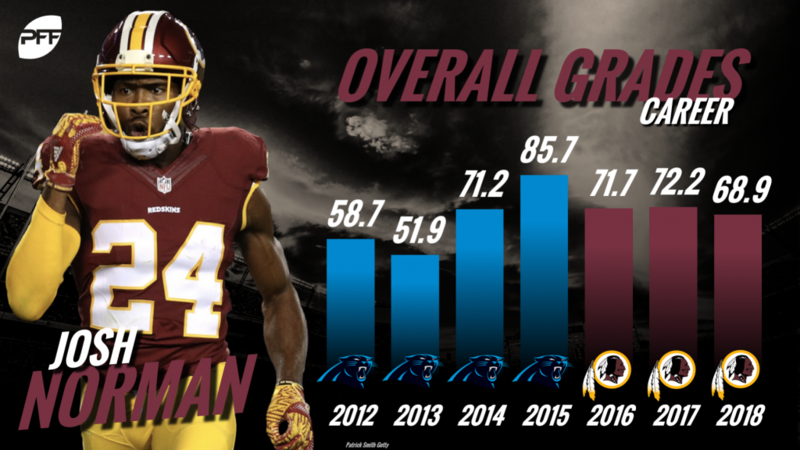 Quinn earned a 69.9 overall grade last season and carries a $12.9 million cap hit with no dead money while Branch earned a 46.9 grade in 2018 and would clear $7 million if cut. Collins was never the same player in Cleveland that he was in New England. He earned grades of 42.1 and 62.3 the past two seasons and would save $9 million in cap space if cut. 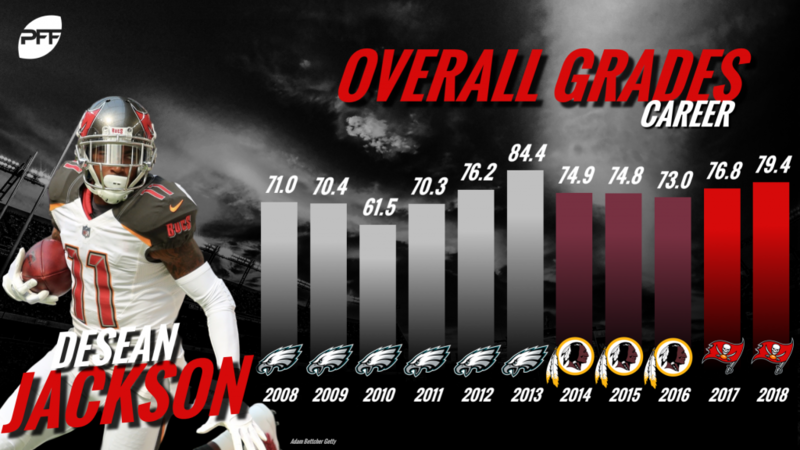 Barron has earned grades of 50.8 and 61.8 the past two seasons has a cap hit of almost $10 million in 2019. He’s been one of Los Angeles’ liabilities defensively, and the $6 million in space the Rams would gain by cutting him could be used much more effectively. He’ll be 33 next year and has been plagued by injuries his entire career. Jaylon Smith and Leighton Vander Esch have already replaced him as starters. They’ll save $7 million by cutting him. Yet another player that, contract be damned, you can’t keep in the starting lineup. He’s earned coverage grades of 41.9 and 38.6 the past two seasons. They’ll save almost $5 million by parting ways. With no Alex Smith, the 2019 season in Washington is already on life support. It’s difficult to think that the soon to be 32-year-old corner is going to be part of their future plans. It would clear $8.5 million in space if cut. Lawson may not carry the huge cap hit of some others on this list, but there is no sense keeping around players who have been liabilities. He’s earned grades of 54.7 and 51.9 the past two seasons in coverage. The Lions get back $4 million in cap space by cutting him. Cyprien is coming off an ACL tear and earned a 56.8 overall grade his first season in Tennessee back in 2017. They’d get back almost $5 million if they cut him.